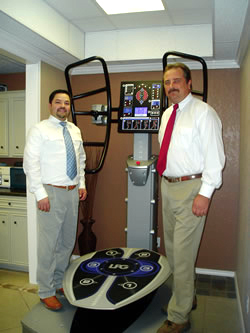 Call Dr. Dan Albracht and Dr. Joey Longoria today for effective and safe treatment of neck and shoulder pain. Chiropractic Center of McAllen in McAllen, TX provides quality care to patients through the expertise of Dr. Dan Albracht and Dr. Joey Longoria. Dr. Dan Albracht, and Dr. Joey Longoria are pleased to provide you with information so that you can make an informed decision about the care of your spine. The following pages will give you an insight into our practice philosophy, treatment protocols, and general information about chiropractic care. Our goal is to return you to a healthy spine, not just to provide patch up care. We strive to fix the problems that cause pain and discomfort. We are very experienced in the latest technologies which work best. Spinal decompression for degenerated and herniated discs, and spinal stabilization of the 180 deep core muscles with the Spine Force 180 rehabilitation machine are discussed at length on the following pages. Thank You for visiting our site. I look forward to meeting you in person and learning how we may be of service to you. Give our office a call, or e-mail us and we will arrange a time to explore your options regarding Chiropractic Health! Call our office at (956) 687-7705 for an appointment today!